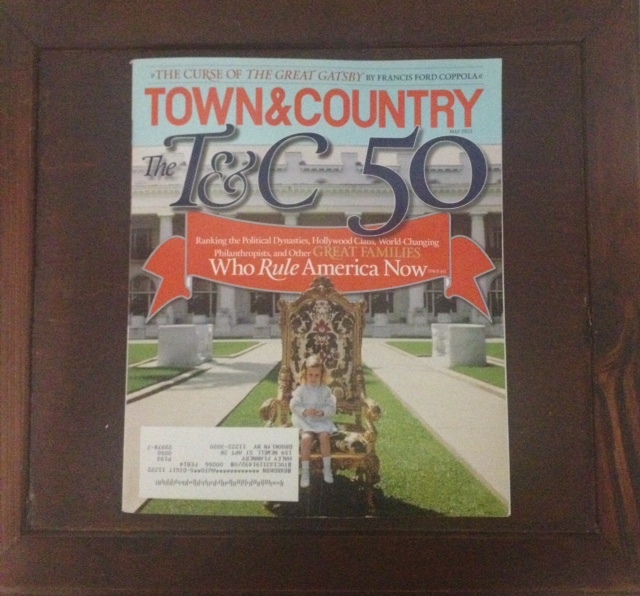 This month, Town & Country ranked the 50 “Great Families Who Rule America Now”. The T&C 50! This is, surprisingly, their first ever list of this kind. I know you’re all just as excited as I am about this, so let’s dive in! – No mention that Julia Louis-Dreyfus (of the Inspiring Louis-Dreyfus family) attended Northwestern University, which also happens to be my alma mater. But alas, I shouldn’t be surprised, since it isn’t in the Ivy League. – And Ted Turner’s generosity extends to the animal kingdom, in the sense that he is “the owner of the biggest bison herd” in North America. – The Wainwrights, almost puzzlingly grouped with other Enduring families such as the Du Ponts, Rockefellers, Hearsts and Vanderbilts, are the only family described as “dysfunctional”. – There is a beautiful photo of David Rockefeller Sr. “at home with his art collection” in which he’s sitting in an armchair next to a big painting of a naked girl. – T&C notes that the Creative Coppola clan includes Nicolas Cage, “an Oscar-winning actor with a taste for Elvis memorabilia and European castles.” Which is like, the most tasteful way I’ve heard Nicolas Cage described in the past few years. – The Kennedys were ranked the 5th most Powerful – behind Families Bush, Kerry, Murdoch and Emanuel – which I find SHOCKING for the obvious reason that you can barely read a page in this magazine without a Kennedy mention. And thus concludes my notes on the biggest letdown of a cover story ever. So now, let’s back it up. To the Editor’s Letter! This month, Jay Fielden discussed tax season and wealth. “Whatever your opinion of the new rates, as members of perhaps the wealthiest readership of any magazine, you are also among the most highly taxed.” He really knows his audience. Except for me, of course, who is not anywhere close to being among the most highly taxed! However, it does seem that the common people crept into his consciousness in the last month. He went to see Le Corbusier’s Villa Savoye whilst in France and noted that “It says, by way of its geometry of beauty and blankness, that the proletariat are people too.” We are, indeed. I found some more sharp commentary in the Inbox. One reader, an etiquette coach from San Jose, California, says that she “must respectfully disagree with the photo essay reflecting the perfect way to exit a car.” (This was in the March issue.) So, how does one exit a car? “The knees must remain glued together, prohibiting paparazzi from snagging the compromising photo.” She details the steps but I stopped reading there because, I dunno, maybe I secretly want paparazzi taking scandalous photos of me exiting a car some day. This month’s Scorecard: John Kerry’s Ties vs. Madeleine Albright’s Pins. Who wins? It’s actually very unclear. They are doing a whole thing about The Great Gatsby this month. Francis Ford Coppola wrote about retooling the 1974 Gatsby script. And they republished the the magazine’s original review of the novel. There isn’t much on the new movie but then, new isn’t really their thing, is it? Speaking of stuff based on olden literature, there is a piece on the new production of Breakfast at Tiffany’s. It contains the following sentence: “That comparison surely has good old Tru popping a bottle of Taittinger in his grave.” I wanted to explain the context of this line but, now that I think of it, there is no need. Anyway, what’s in style this season? T&C’s Style Spy tells us! – Two things: designer athletic equipment (ex. Tommy Hilfiger baseball bats) and evening flats (which are a thing I can definitely get down with). – Also, HATS. Only they are super fancy and designed by Aaron Keppel (of id Design, based in – gasp – Brooklyn), who created a dope headpiece that the magazine calls a “skull flowers creation” for a contributor. – “How is it that Roman women can eat pasta on a daily basis – Italian women do have joyous appetites – and still ease into their sleek, fitted clothes?” All of them see personal trainers. – “One of the hallmarks of the Roman woman’s composed and exacting style is that there’s never a hair out of place – literally. Women visit the salon three or four times a week for professional blowouts.” Haha, stop it. – Some Roman people like to visit an “Austrian naturopath, who specializes in ‘energy vibrational therapy’”. Also, we should travel to Paris to learn how to take care of our skin! Sadie Stein’s essay on this is actually lovely. Read it. What’s everyone been up to in society these days? Well, some dudes (Hasty Pudding) honored another dude (Kiefer Sutherland) with their Man of the Year award and now there is a page in T&C with pictures of past honorees in silly bras! Also, designers appear on the runway after their shows in different ways. Michelle Kwan got married. “The January wedding was a suitable choice for Kwan, who competed in the Winter Olympics twice.” What I’m getting from that is that her wedding wouldn’t have made it into the magazine if it had been in the summer. OK. Who injured the author so grievously that he was inspired to write this piece? Only the most delightful French couple of all time! “The man, whom we’ll call Maurice, designed landscapes; he had a moderately successful practice, nothing fancy, based largely on his pleasing color sense. His wife, Camille, was more aristocratic – she had matrilineal ties to Proust – and she kept a lovely home, entertained with aplomb, and lunched, when she could, with gay men of style.” They can friendnap me anytime! And finally, we have an excerpt from The Astor Orphan, a memoir written by Alexandra Aldrich, a descendent of John Jacob Astor, who grew up in a dilapidated forty-three room mansion that her family inherited. The excerpt was fine, but it left me with a desire to watch Grey Gardens, which I might just indulge right now. So, there we have it. Please join me next month when I will once again attempt to find new ways to talk about Town & Country finding new ways to talk about the same rich people all over again! Even more boring than the magazine itself!